Without ever having been there, I saw Kodiak as a special place. I have not quite figured out why exactly besides the fact that my grandfather spent much of his WW2 time on this awe inspiring island. I could not wait to get my feet planted on that majestic soil. First things first though, conquering my fear of small planes. 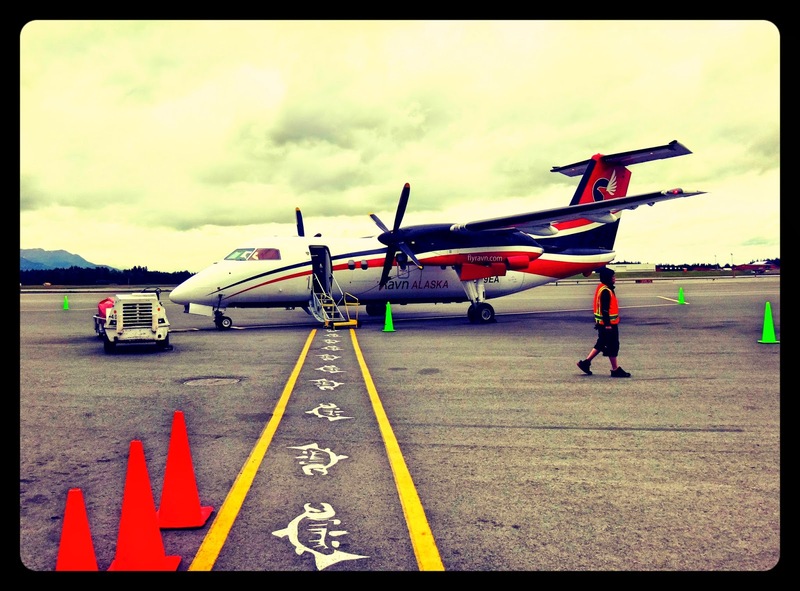 These tiny planes, also known as Air Taxi's, dot the Alaskan skies and are a very common mode of transportation between small villages. Quite frankly, I am not even sure if what I was scheduled to fly on would be considered an Air Taxi with its eight rows of seats. 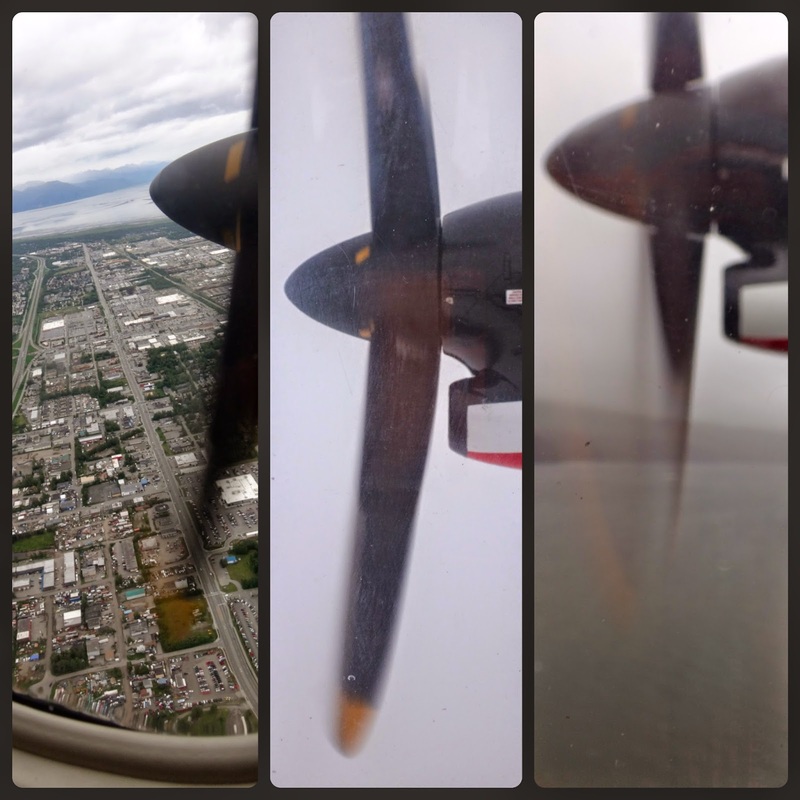 The De Havilland Dash 8 Turboprop is part of the Ravn fleet of planes. Ravn was formerly the conglomerate group of Era Alaska, Frontier and Hageland Aviation, which made up the largest air carrier in the state. They even used to have their own reality show on the Discovery Channel, titled Flying Wild Alaska. 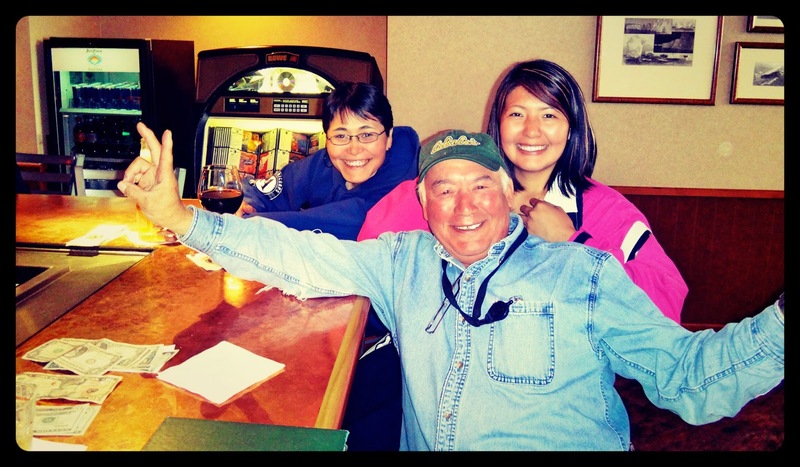 There you could catch a glimpse of the day in the life of the Tweto family, who ran Era Alaska. This show quickly became one of my favorites, because it allowed me to see what flying the Alaskan skies was like for my grandfather. The company eventually went through a re-branding and sadly the show is no longer being filmed. Sometimes, if your lucky though, you can still catch the reruns. Remarkably, it is said that one in ten Alaskans is actually a pilot. You would think that all this information would bring me some comfort. Nope. Not so much. I arrived at the Anchorage Airport the usual one hour early, only to find no lines and a lot of pre boarding time on my hands. The plane was so small that there were no assigned seats, and actual boarding time was only 10 minutes before the flight. So I did what any nervous gal would do to calm the nerves, I hit the airport bar. Parking myself in the only open spot they had, next to a friendly local gentleman, who had plenty of cash lying in piles on the bar in front of him. He immediately engaged me in conversation about who I was and where I was off to, in the exchange for his own information. He, named Sam, was from the North Slope. The North Slope being as far North in Alaska as you can be along the Arctic Ocean. There is big oil all along the North Slope so it is, surprisingly to me, a busy place. Oddly, Sam did not know where his final destination was. Guess he was just going to hang out in the airport for days.... a whole different kind of adventure. Beside him (at least according to him) we were his new best friends, two native Alaskan women, Nastasia and Wilma. One from Bethel, and the other from Hooper Bay. What a great, but brief time we had. As I began to tell them what had brought me to their state, they expressed the importance of knowing how WW2 effected the Alaskan natives. How so many of them were relocated and interned. How families were separated. How land was taken away. Villages torn apart. A whole other disheartening and often overlooked calamity of war. Although brief, I learned a lot from my new friends. It was one of my most memorable moments for sure. As all good things must come to an end, so did my time at the airport bar. Fifteen to twenty minutes before boarding, I said my good byes and headed over to the gate, only to arrive there and find the crew waiting for the last passenger to board: me. Apparently they had been calling my name over the airport loud speaker. Evidently, airport speakers do not work in the airport bars. Whoops. I boarded, and seeing as there was no allotted seating, I picked almost the first seat I could find which was not that difficult as the plane was half empty. I chose a seat next to a girl about my daughters age. Turned out to be a well suited partner for my first teeny tiny airplane experience. She was a transplanted Kodiakian on her way home to see her grandmother, Barb, for the summer. This brave lil girl was flying by herself, although I am positive she would not think of herself as courageous, as she has been flying this route solo, for years. And as I looked around the plane, not one passenger looked the least bit nervous, except me, the wimpy outsider. I chose to take some comfort in everyone else's calmness, at least momentarily. She talked the whole trip about this or that. Showed me her fashion designs. Told me about her parents, her siblings, her grandmother... it was the perfect distraction. Until we landed. Then her chipper tone turned into one laced with doubt about why we kept descending, without being able to see the ground, and how surprised she was, that we could not yet see land. Oh boy. Finally, several hundred feet above the water, we were below the thick fog, and landed safely on the frequently wet Kodiak runway. Albeit a bumpy landing, enough to make the flight attendants eyes light up, I had made it. Afterall, I am on a mission to retrace my grandfathers steps, and flying in the fog is all part of it. Why would it be anything different? Middle- The view for 55 of the 60 minute flight. few minutes before we landed. 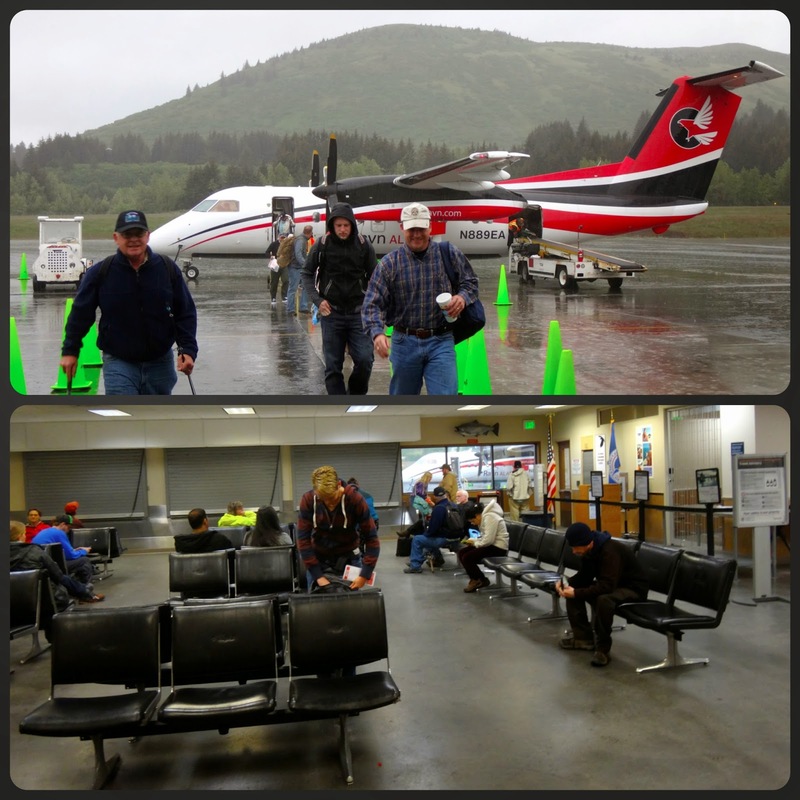 Top- A rainy Kodiak welcome. Bottom- The airport. That's pretty much all of it. If you look closely, you can still see our plane outside the window. Once in the airport, I introduced myself to the grandmother of the little blessing that I sat beside on the flight. In a typical small town fashion she then offered to drive me to my destination- Mrs. Potts Bed & Breakfast, whom she knew. Of course. Come to find out, everyone knows everyone in Kodiak. Our drive home turned into a rainy tour of the most adorable and beautiful fishing town. I would say, that the fog and the rain was a warm Kodiak welcoming, that was part of the authentic experience I was looking for. I welcomed it. In fact, when I arrived at the B&B I dropped my stuff off, suited up in my spunky new orange rain gear and hit the streets, to find myself a beer and a warm meal, preferably something freshly caught, like Kodiak cod. 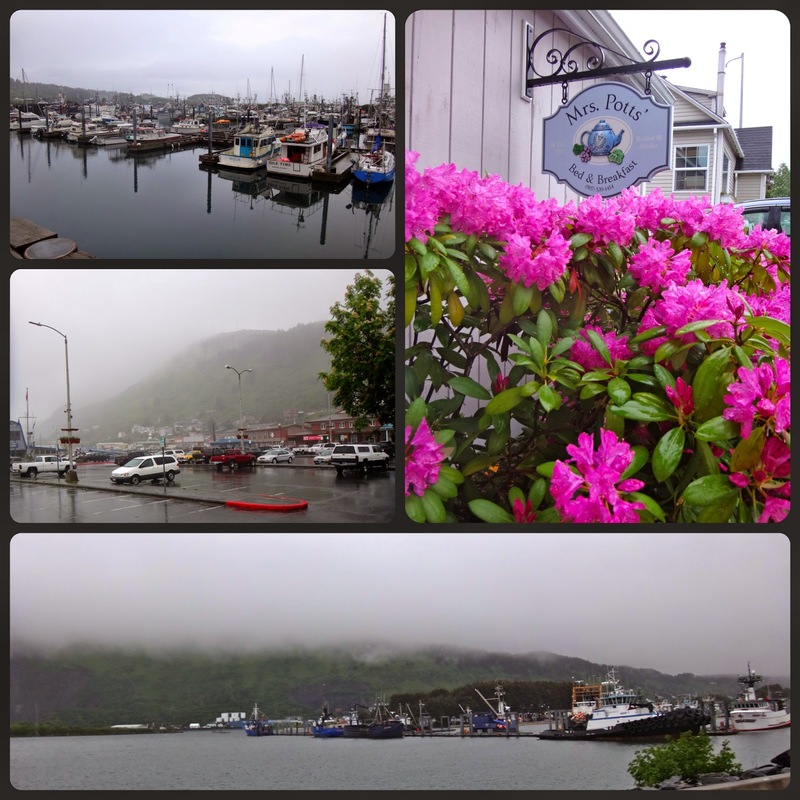 Top L-R: Foggy Kodiak Harbor, Mrs. Potts' B&B- my home away from home. Second L: The Mall; a U shaped section of a few stores and bars in downtown of Kodiak. Bottom: View of a harbor where some Deadliest Catch boats dock when not at sea. Note the thick fog we just landed in. There is a large mountain hidden within it. Henry's Great Alaskan Restaurant in the downtown "Mall" sounded like just the spot. The place was packed, mostly with hungry fisherman it seemed, all fueling up and letting loose after a long rainy day of hard work. The food was scrumptious and the local beer was smooth. Just what I needed at the end my day's adventure. Before returning to my quaint little B&B, I leisurely strolled around the harbor in the rain, soaking the experience all in, and thinking about my grandfather and his comrades, and how they would have been strolling in this same spot 70 years ago. Sigh, I had finally made it. 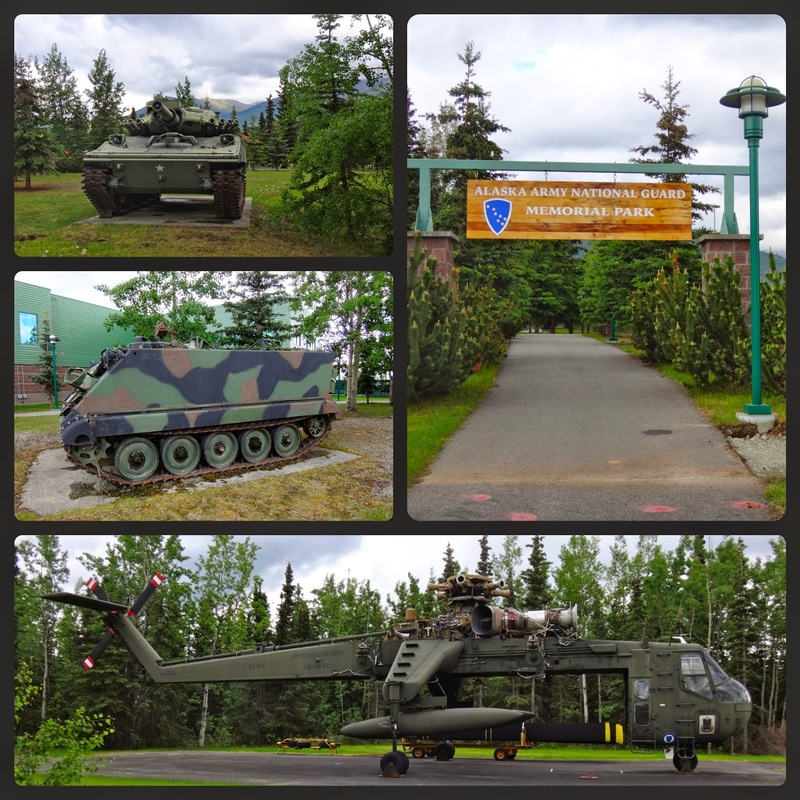 Just thought I would share some of the other sites around Elmendorf-Richardson Joint Base. It is very large base as you can imagine with both the Air Force and Army stationed there. Unfortunately, we went on a Sunday so the runways were quiet. We'll try again next year to get an up close experience with an F-16. 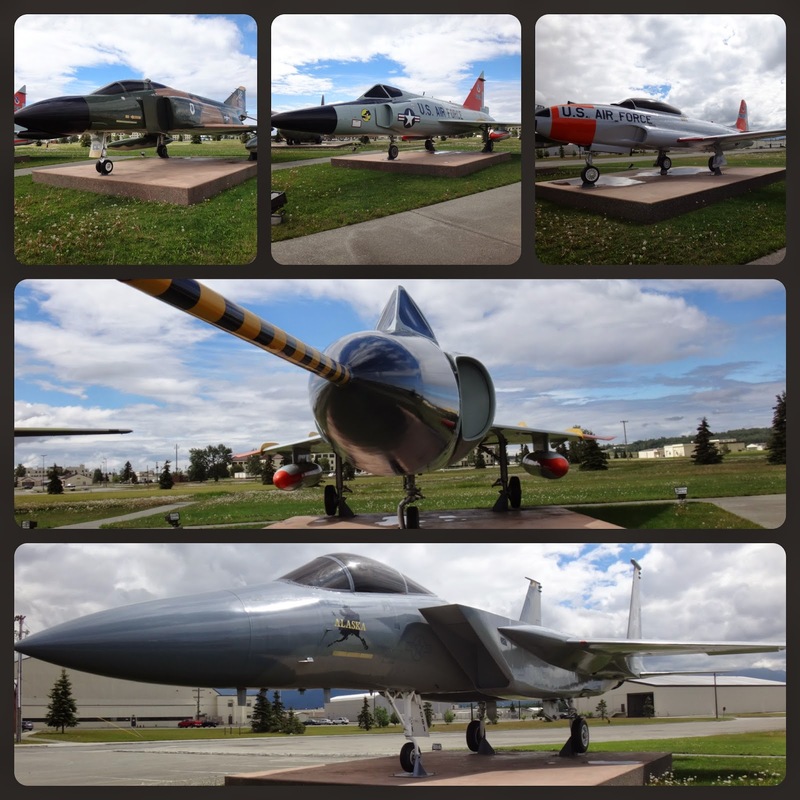 One of the things we did see was some of their retired aircraft, both old and new on display. 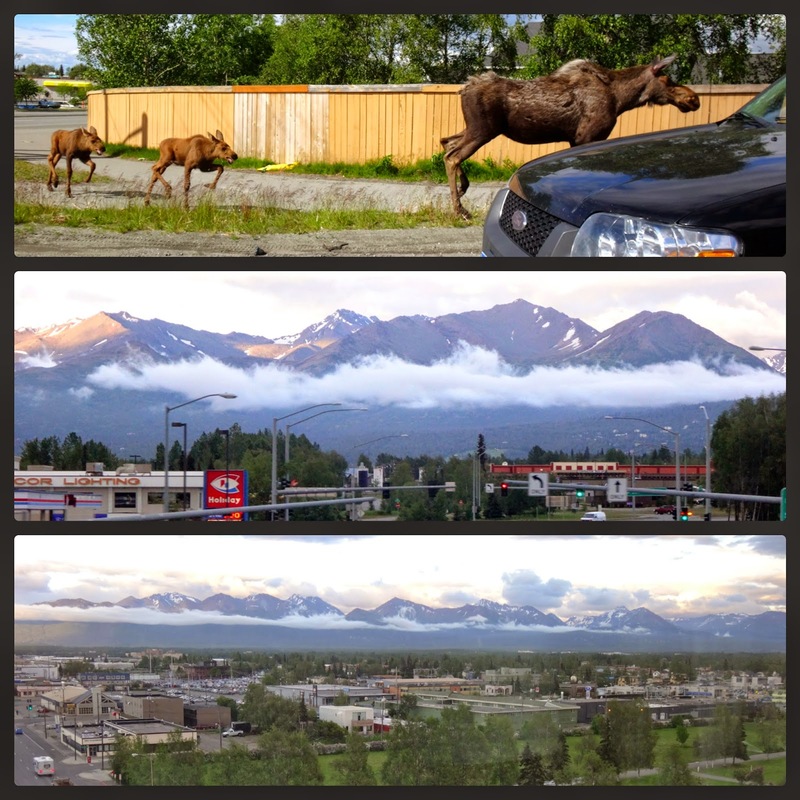 The weather the day we went was so pleasant that we had absolutely no problem leisurely strolling around base enjoying the glorious sunshine and clean Alaskan air. Clean is no over exaggeration, the smell of Alaskan air is so light. It seemed effortless to breath. A wonderful break from the thick, heavy moisture filled air that I am currently gasping for during this near one hundred degree Florida summer. 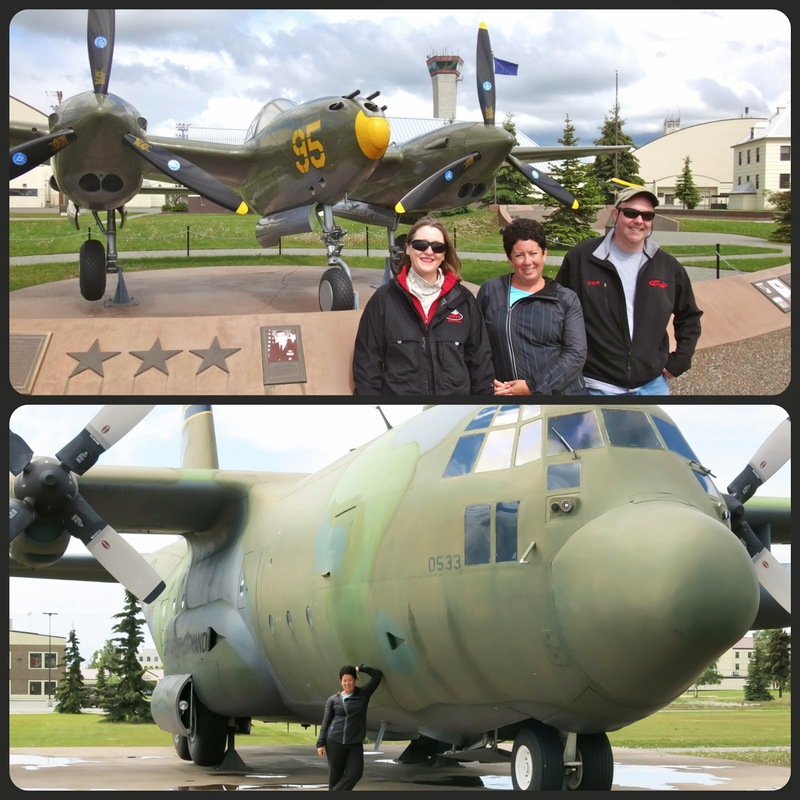 Top- A recovered & refurbished P-38 our guide, Col. Cloe helped recover from Attu Island in 1999. Bottom- Little ol' me and a enormous Hercules. apparently too many. 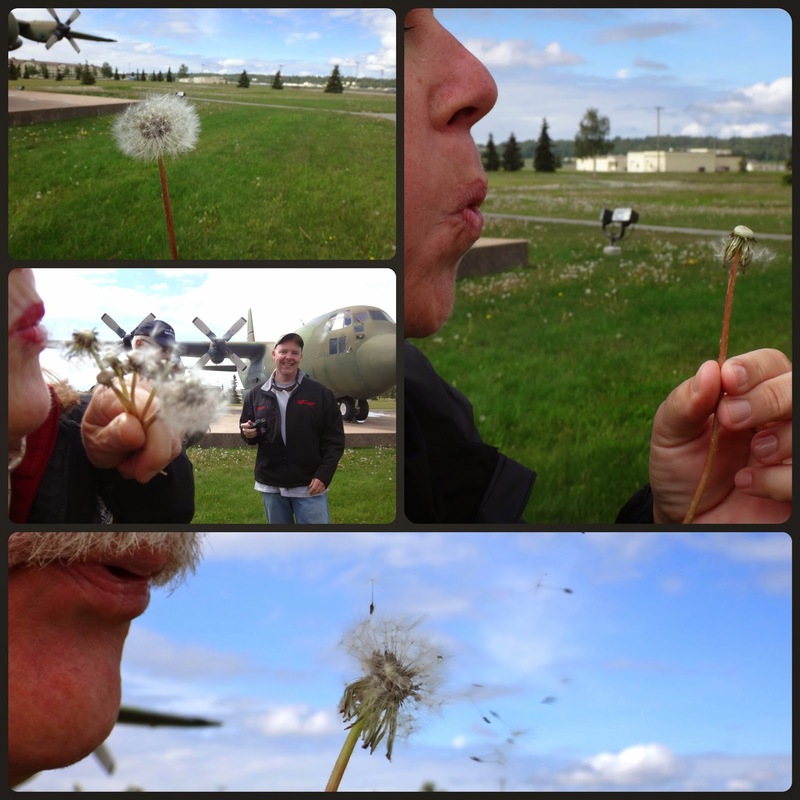 Dandelion fun. Something we don't have in Florida. 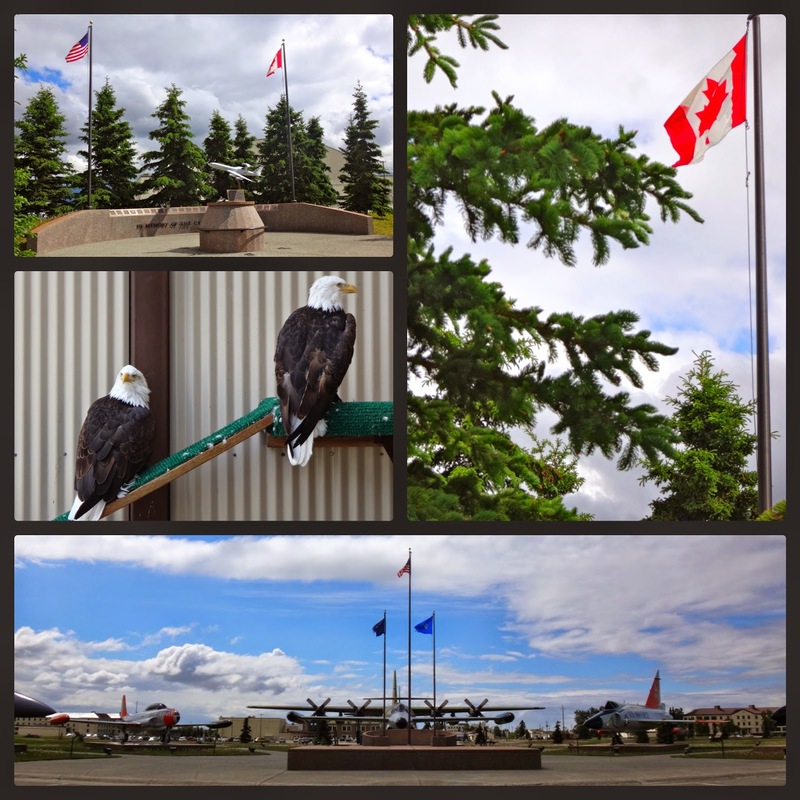 Alaska National Guard Memorial Park. Top L- tank, personel carrier, Sikorsky CH-54B Sky Crane. the late night view of the Chugach Mountains from my room. That concludes day two in Anchorage. Next up, a bit of work related research in the form of a visit to the Ice Spa, it's rough, I know.... Then, off to Kodiak Island!